The most common of all repair problems begins with the initial set-up of an instrument. Of course, the main objectives of a proper instrument set-up should include playability and tone quality. This is achieved with a properly cut bridge and soundpost, adjustments to the fingerboard and nut, and pegs that are fitted to turn properly. To ensure that your instrument is playable and has the best possible tone, the bridge must be hand-carved to the proper height and curve to match your specific instrument. Bridges are not interchangeable. If the bridge is too low, the instrument may produce buzzing sounds when playing. If it is too high, fingers may become sore and certain notes may be unplayable. The feet must also be fit perfectly to your instrument. If they are not shaped correctly, the bridge may not stay in place and may spontaneously pop off of the instrument. If the bridge is too thick, it may cause a muted sound. If the bridge it is too thin, it may be prone to warping or breakage. When the bridge is cut to the right height and thickness, and the feet are fitted correctly, the instrument will be easier to play and will produce a much more pleasing tone. The fingerboard and nut of your instrument are quite often overlooked in the set-up stage of an instrument. If the nut is not set to the proper height and the fingerboard does not contain the proper scoop, your instrument may produce harsh buzzing sounds or be nearly impossible to play. If any of the above problems seem to fit with what you think is wrong with your instrument, bring it to a professional luthier immediately. Do NOT try to repair your instrument yourself. A good rule to remember is that if you do not feel confident to do something, you probably shouldn't. Sometimes things happen that are unexpected and may be nerve- racking including: your soundpost falling down, your bridge popping out, seams coming unglued, cracks appearing, pegs slipping, buzzing sounds, strings breaking frequently, and tailguts breaking. These things can all be fixed by a professional. If your soundpost falls down, loosen your strings about 1/2 turn each and bring your instrument to a professional repair person immediately. This can happen from changes in temperture and/or humidity or the post may not have been fit properly originally. If your bridge falls down, first check for cracks or damage that may be a result of the bridge falling. If you are experienced with this problem, you can attempt to set it back up yourself by loosening the strings a touch, putting it back in place with the lower side of the bridge under the string with the highest pitch, and aligning the feet with the center of the "f" hole notch. The strings should be centered left to right over the fingerboard. Re-tighten the strings a little at a time on each peg and be sure to check that the bridge is not pulling forward. Make sure that the back of the bridge is perpendicular to the top of the instrument. If you do not feel confident that you can re-insert the bridge, do not attempt it. You may cause bigger problems like breaking the bridge completely. 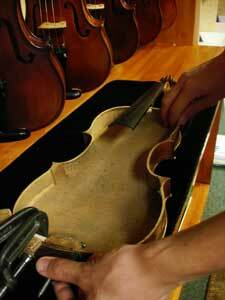 If you see an open seam or a crack forming, bring the instrument to a professional for repair immediately. This can be caused by changes in humidity and temperature, dropping or bashing the instrument, or sometimes it might just be a fluke. If you delay on repairs, the problems could intensify. If your pegs slip or stick, bring your instrument to a qualified shop immediately. If you delay, you might unnecessarily break strings and get frustrated. Once again, this could be caused by improperly fit pegs or changes in temperature and humidity. Sometimes simple solutions like peg dope (which is used to make your pegs turn more easily) or peg drops (which are used to make your pegs stay in place once you tune them) may be used to solve the problem. Otherwise, your pegs may need to be adjusted by a professional. Another common cause of this problem is that the string holes on the pegs may have moved too close to the side of the peg box. This could cause your pegs to slip quite often. If this appears to be the problem, take your instrument to a professional repair person to have new holes drilled where needed. If you hear unusual buzzing on your instrument, first check all your fine tuners and tighten any that are loose on the part that attaches to the tailpiece. Next, you should check the other common culprits, including: strings (if any are ancient, replace them), chinrest (check to see if it is loose; tighten as needed), fingerboard (see if it is loose; if so, bring in for immediate repair), seams or cracks (check for open seams and open cracks; if there are cracks or open seams, bring in for immediate repair). If your tailgut snaps, it is not the end of the world. Quite often it appears much worse than it is. Bring it in to a professional repair person as soon as possible. This is an easy repair when done by an expert. If strings keep breaking, be sure to note which strings are breaking frequently and where they are breaking (i.e., close to the fine tuner, right over the nut, or right over the bridge, etc.). 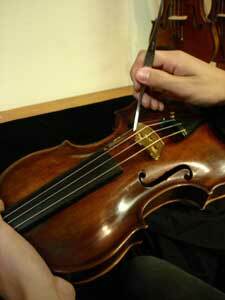 Keep the old strings and bring the instrument in for a professional to thoroughly check for possible problems.